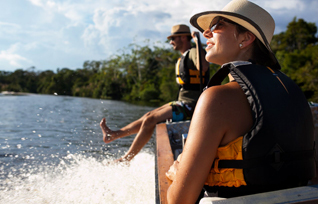 Two people for the price of one can enjoy Amazon Basin cruises on select departures if bookings are made by Jan. 31, 2018, through AdventureSmith Explorations, the small ship cruise experts. Three deluxe riverboats engaged in this early 2018 program promotion offer luxury suite accommodation for three and 4-night cruises from now through the end of April: the 8-guest Delfin I, 28-guest Delfin II and 43-guest Delfin III. A rate for one person that allows a companion to travel for free starts as low as $2,400 for four days. The period of this promotion is the Amazon Basin’s high water season. Itineraries in the Amazon vary based on high water and low water seasons. High water season is November to May and allows for more extensive exploration and access via water routes. These months are ideal for travelers who prefer to duck into otherwise isolated corners of the reserve aboard motorized boats and to see riparian plants, fruits and flowers. Low water season is June through October and allows for more trail walks; these months are ideal for travelers who prefer to walk through the rainforest and discover its flora and fauna. All listed activities depend on water levels, weather and season. Travelers equipped with a sense of adventure and curiosity tend to enjoy their experience in the Amazon jungle regardless of the season. Experienced guides explain the region’s biodiversity. Voyages include visits to native villages, kayaking, swimming in waters frequented by pink river dolphins, fishing, daytime hiking, and night safaris. On board, guests can enjoy exquisite Amazonian cuisine in an authentic, intimate setting with the right amount of elegance and comfort. The ships are varied in their size, but all feature extra-large or panoramic floor-to-ceiling view windows. The 8-guest Delfin I is the most intimate and romantic, with its luxury suites all featuring their own terraces, two with private cold-water whirlpool baths. For more information please visit https://www.adventuresmithexplorations.com/amazon-cruises. For more information on all of AdventureSmith’s programs, trip availability, and reservations, please call 1-877-620-2875 toll-free or visit http://www.adventuresmithexplorations.com/.